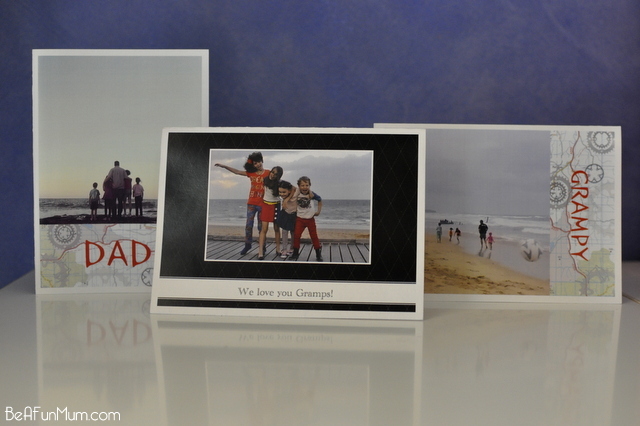 Personalised photo gifts for Father’s Day are always a win. 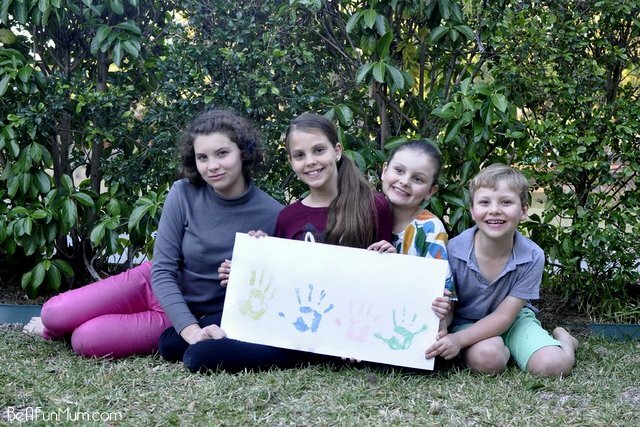 The first thing is to get an updated picture of the kids. 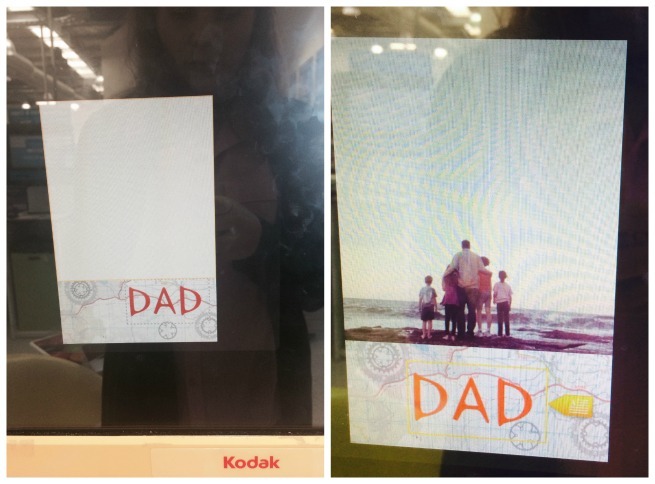 Below are ideas on taking fun photographs of the kids and how to turn pictures into gifts easily at the Kodak Kiosk at Officeworks. 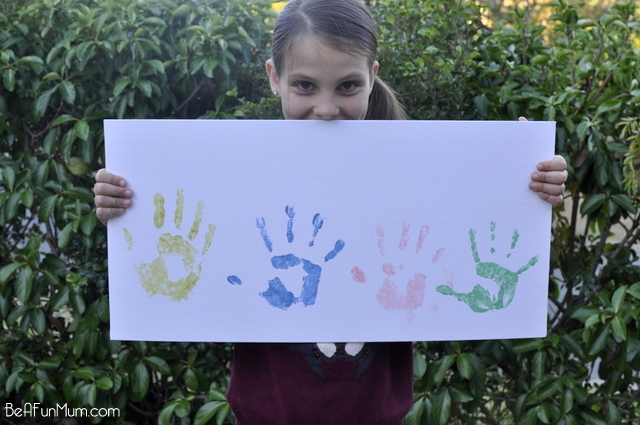 We’ve done this a few times because a handprint canvas makes a great photo prop, plus also doubles as a keepsake. Find a step-by-step tutorial here. This looks fantastic on the front of a card. The idea is to use letters as props for this photograph.
? 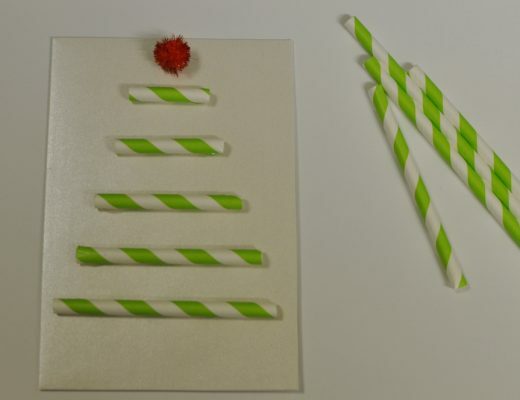 Cut out letters: draw or print letters out on light cardboard and cut around the outline. This is my personal favourite. 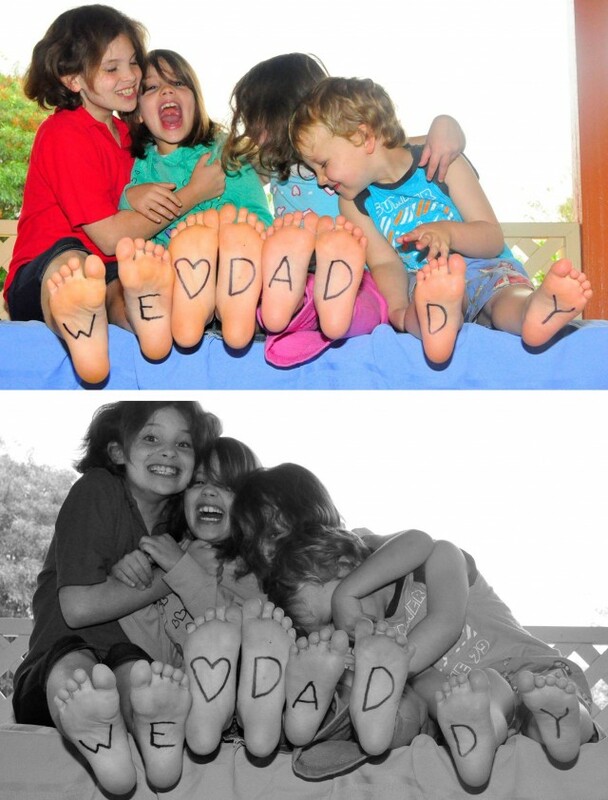 Draw a message to Dad on the children’s feet before photographing. My kids thought it hilarious. I had quite a few feet to write on but you can adjust the message to suit the size of any family (ideas below). Arrange the child/ren sitting on grass (or picnic mat). The photographer should lie down to ensure the feet are in the forefront of the picture. Sit the children on a sturdy table/chairs (depending on age of children) and crouch down to take the picture so the feet are in the forefront. The feet are the feature here so it’s a good idea to ensure the background isn’t too busy. Tie a huge bow around the baby or pregnant belly for a photograph. The picture I used for a gift to my husband was one I snapped with my phone camera when at the beach one afternoon. It represents the wonderful father he is and how much the kids adore him. Sometimes you don’t need to stage pictures to get something special. Christmas 2013 was special. My Dad was back from Africa and we were all together. If there was a picture to represent our extended family — cousins playing, aunts and uncles chatting, grandparents doting — it’s the picture below. 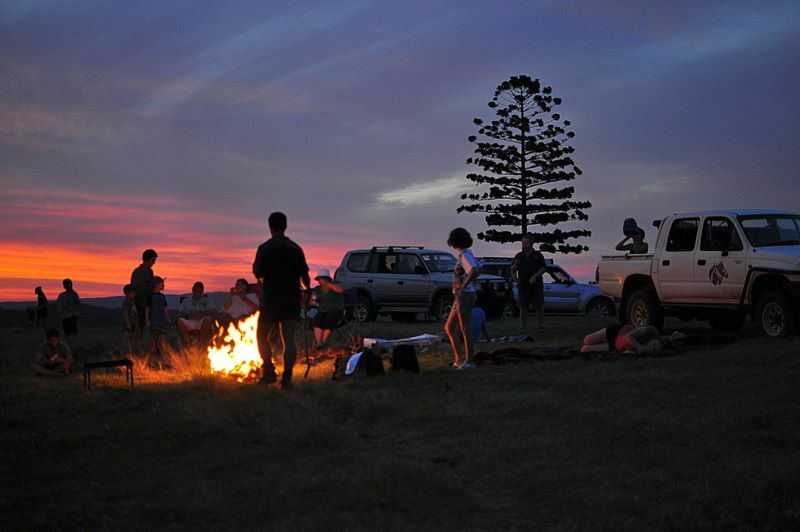 It was taken high up on private property with 360° views where we experienced an incredible sunset and a BBQ-in-the-paddock dinner. I decided to turn this photograph into something special for my Dad for Father’s Day (you can see what I did with this picture further below). 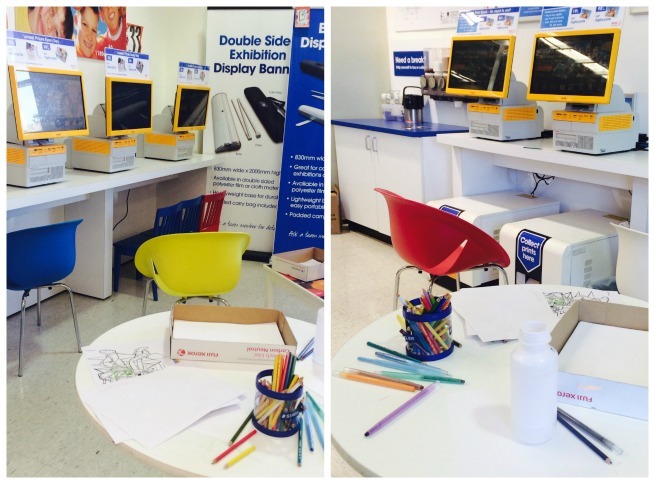 My local Officeworks has many screens available so there was no waiting (plus there’s a drawing desk for kids). You can grab your photographs from just about anywhere: memory card, USB, Facebook and Instagram accounts and directly from a smart phone. Tip: If you plan to use photos from your smart phone, download the KodakConnect app before you go to make the process quicker. The app is free and allows you to connect your phone to the Kodak Kiosk through Wi-Fi. Once the pics are uploaded, it’s simply a matter of picking what you want to do with them. Note: Some gift options will take 7-10 working days so leave enough time for them to arrive before Father’s Day. I made cards for my husband and both my children’s grandparents. It was printed on the spot. Done. I printed photos while I was there (that I have been meaning to do for some time). Printed on the spot. Done. I made a mug for my husband (a big coffee drinker) with the image from the beach and the card matches. The mug took 7 working days. My favourite thing is the canvas of the sunset picture for my Dad. The turn around time on the canvas was only 3 days, however, generally allow 7-10 working days. Making a card at the kiosk. I was able to customise the font (Dad, Pop, Grandad etc.) and enhance the photos before printing. This is how the cards turned out. Matching mug and card which is fun! Out of all the gift options, this is my favourite. 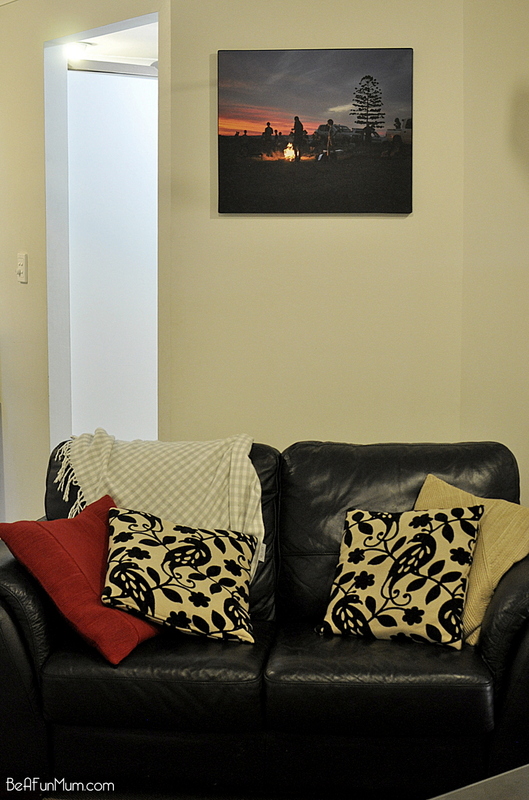 You can easily turn a favourite photo into artwork for the wall. Such a special gift! This is how the sunset picture for my dad turned out. It looks fantastic! For more details on how it all works, check out this video from Officeworks. Photo gifts are useful, special and are fun to look back on and cherish years later. They are memory markers. Giveaway now ended. Congratulations Helen! I’m giving away a $100 Officeworks gift voucher to celebrate Father’s Day. 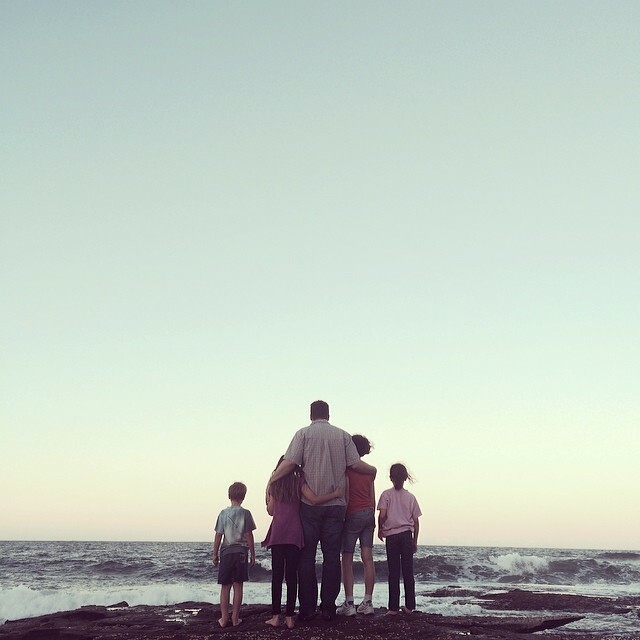 To enter, just head over to the Officeworks website and take a look at the Kodak photo services available and leave a comment below telling me what you would create for Father’s Day and why. Giveaway is open from 12:01 am Australian Eastern Standard Time (“AEST”) on Thursday 21 August 2014 ends 5pm AEST Thursday 28 August 2014. Read the complete terms and conditions here. 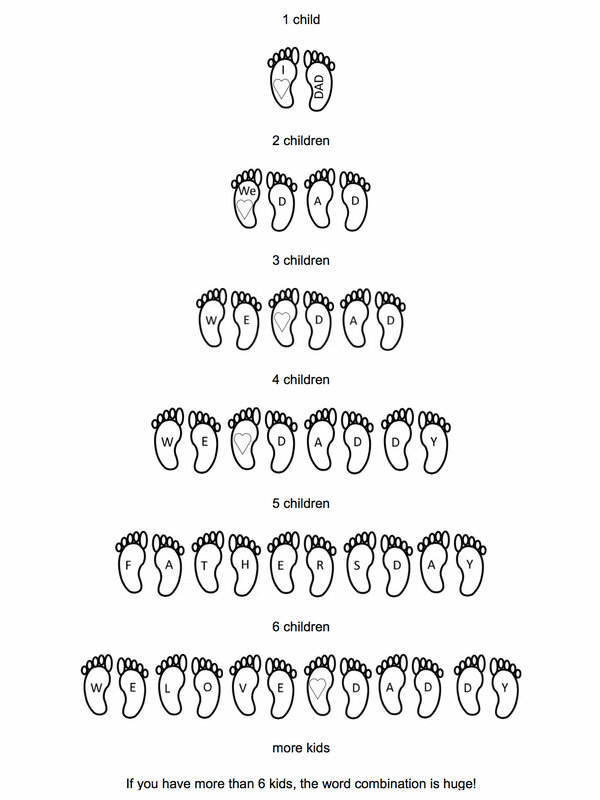 I’m going to do the ‘we <3 Dad' on our kids feet this year, and would love to get it printed on a canvas for my wonderful hubby for Father's Day. I would get a mug for my Dad with a picture of me and my three siblings on it. At his work they all have a sneaky competition on who has the coolest mug, this would definitely help him win! I love the idea of drawing on my kids’ feet, although I’m not sure how much success I’ll have getting my just-4-yr-old, 2.5-yr-old and not-quite-1-yr-old to all sit still long enough to take a picture! I’d love to put it on a beautiful card or even print it on a canvas if I managed to get a magical shot. I didn’t realise Officeworks had so many options – I will have to explore more! Thanks for the great ideas. The Dad in this house is doing lots of renovations in our home. Thinking of making characters with his hammer,saw etc (funny faces etc) then photo on canvas…to remind him of the amazing work he has done making a home for his 3 kids. I am getting a set of photos done of the kids, and would love to get them printed and framed with Dad and 2014 on it. My father died just over a year ago. I’d love to take a favourite photo and have a canvas made. He would have got a kick out of seeing the picture up on the wall. He loved clever ideas. He is in our thoughts every day, not just for Father’s Day. I’d make a photobook with pictures of every member of the family as well as pictures of his house and neighbourhood because after having a mild stroke last month he unfortunately sometimes struggles to remember people and places. I LOVE your ideas for canvas’s for Father’s Day – Absolutely awesome!!!! A calendar, with important events listed on it such as our anniversary! A photobook of all the silly things he’s done, to let him see why we’re always laughing, not at him but with him. Will be a fun book full of so many happy memories. An iphone case with our precious three girls on it as he takes his phone everywhere with him! A mug! Dad does not have his own mug and is always using my favourite kitten mug, so this way he has his own personalised mug!!! Oh my goodness, I’m going to make up a photo calendar for my husband! He’s just started a new job where he has to work away for weeks at a time. With a calendar he can take it on the road with him, see gorgeous photos of him playing with our son, and cross off each day that passes until he’s back home again. What a perfect present! I adore all of these ideas. Thanks for the inspiration! I would get a personalized mug made for the father of my children. A coffee is the first thing he makes every morning, so seeing a beautiful image of his girls would make him smile every time he starts his day! 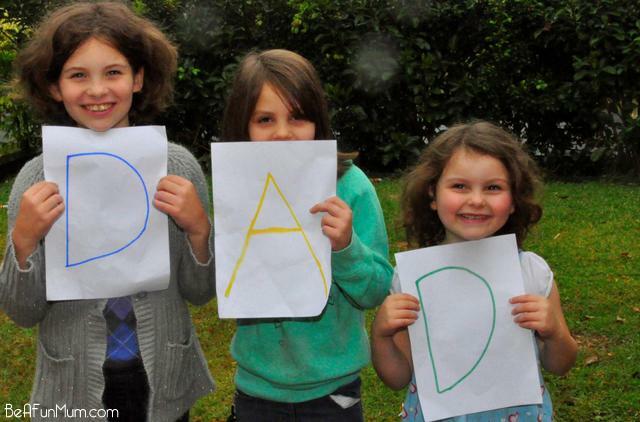 Love this post, you have given me some great ideas for at least the next 2 Fathers Day – a celebration that I always struggle to come up with an original idea that hubby will really appreciate. I love the writing on the feet idea, having 2 boys who can’t not do a silly face in a photo at the moment it should look quite fun. I really like the matching card and mug. Loving the canvas idea as well, I can think of a couple of photos that would be good but not perfect. Will definitely store that idea away for next year. After many years of part-time study, hubby graduated from uni! I’d love a large canvas print from the occasion to hang in the hallway with the other photos of milestone events! A personalised mug with a picture of our mugs on it! And really make their Father’s Day! A canvas with a recent photo I took of hubby with 5 of his 6 children all together for the first time. Hopefully we can then get one done of all 6 together in time for Father’s Day next year – that would be the best gift ever. So I think that a personalised one might be the go this year. I LOVE these ideas. I was looking for some photo ideas for hubby for fathers days and this post sums up lots of options nicely. 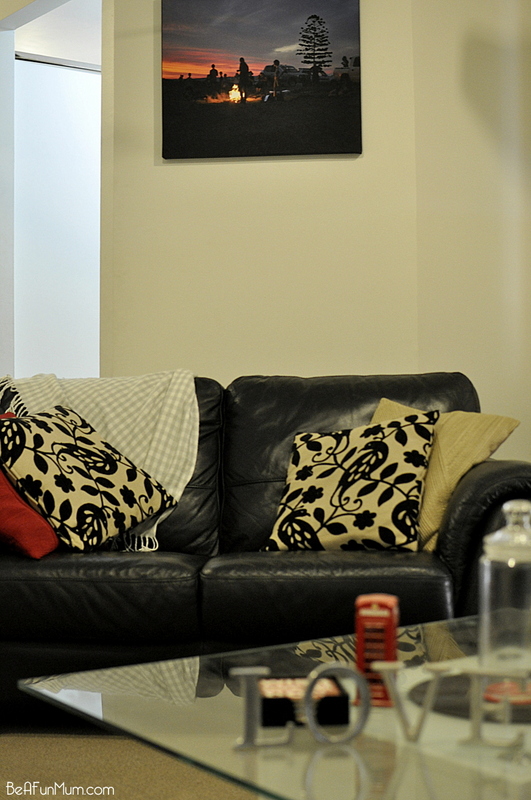 A lovely photo to accompany a large bottle of rum should go down pretty well I think – haha! 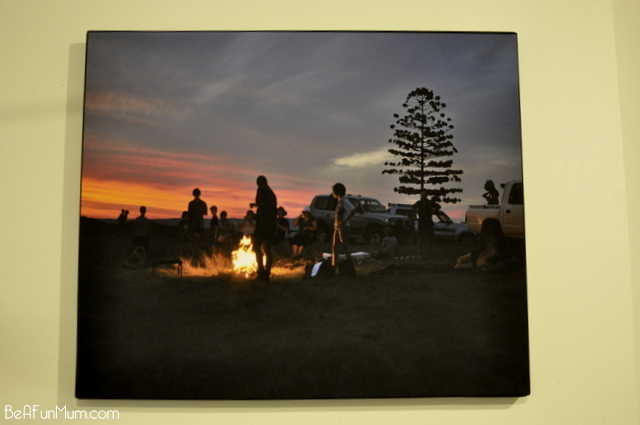 I love the idea of a photo canvas. We just got back from an exciting New Zealand holiday, so the difficult part will be deciding which photo to use. My father’s dog just passed away, I would love to use a collection of photos of both of them and get it printed on canvas. I think it would cheer him up reminding him of all the great years together. A photo book looks good to me. A great keepsake for Dad to keep at his computer desk, where he usually is most of the time lol. A coffee mug with our three children’s artwork on it would be perfect for our artist Dad. 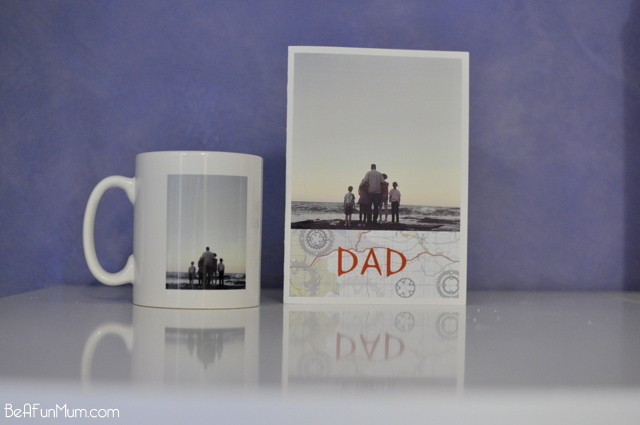 I’d buy my dad a coffee mug – photo frames are a disaster for him because he doesn’t understand the concept of dusting and constantly knocks things off his desk, but a mug would be well-used and the photo enjoyed constantly!